Return to the Costa Rica Fish Identification Chart or you can visit our Costa Rica Fishing home page. 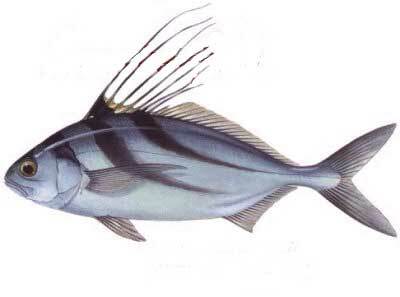 Fish Description: The Roosterfish is easy to identify because there are no other fish in the world that are similar to them. It is one of the more popular fish that sportfishing enthusiasts love. The Roosterfish is typically caught more during inshore fishing charters and even from shore if you cast out past past the surf. Size: Typically these fish range from a few pounds up to the trophies which can exceed 100lbs. Remarks: Roosterfish are usually not considered a good eating fish and so catch and release is normal. Feeding while in packs on sardines and other small school fish.